Cannabis in Nigeria is illegal yet the country is a major source of West African-grown cannabis, and ranked world's eight highest consumer of cannabis. Cannabis is widely grown across the States of Nigeria including Ondo State, Edo State, Delta State, Osun State, Oyo State and Ogun State. 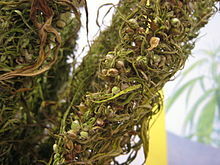 Dried seeds of Cannabis sativa. Though cannabis has long been present in Eastern and Central Africa, as well as throughout North Africa, most scholars believe cannabis only gained traction in Nigeria in the 20th century. It is widely believed that cannabis was introduced to the area by soldiers and sailors returning from conflict zones in North Africa and the Far East during and after World War II, though some scholars have stated that British colonial authorities had engaged in small-scale cannabis and coca cultivation as early as the 1930s. The cultivation of cannabis spread rapidly during the 1960s thereby making it a public issue in Nigeria after its abuse by individuals and psychiatric patients. By the 1950s, arrests of Nigerian cannabis farmers are documented, as well as a small flow of Nigerian cannabis to the United States and Europe, and some import of cannabis from South Africa and the Belgian Congo. During the early 1970s, the use of cannabis became common among soldiers who abused it in order to suppress timidity. The use of cannabis became popular among youths between 1980-1990. During Nigeria's second military Junta, the military rulers issued Decree 20, which made the death penalty an available punishment for drug trafficking, though this was used only sparingly, focused on cocaine, and removed in 1985.:116 Nigeria strengthened its focus on cannabis eradication with the 1994 launch of "Operation Burn the Weeds", but the eradication program peaked in the 1999 at 3500 hectares (vice 40 hectares in 1994) before falling substantially in the 2000s. Despite Nigeria's role as a transshipment point for cocaine and heroin, throughout the 20th century cannabis remained the only illicit drug produced domestically. Cannabis is one of the most widely used illegal drug in Nigeria. Cannabis has no religious or medical use in the country. A study of secondary schools in Northern Nigeria, substance abuse ranged between 1.1 ‑ 3.5% with a male to female ratio of substance abuse of 3:1. 3% smoked cigarettes, benzodiazepines abused by 3.5% and solvents by 1.5%. Abuse of cocaine and heroin was 1.1% and 1.3% respectively. In a study carried out in about fourteen psychiatric hospitals in Lagos indicated that cannabis abusers are responsible for 13.8% of the total drug related admissions for 1992. Cannabis use and other related drug abuse cases is controlled by the National Drug Law Enforcement Agency in collaboration with the U.S government to combat narcotic trafficking in West Africa. The possession of cannabis is illegal and is punishable by a minimum sentence of 12 years in prison. In serious trafficking cases, life imprisonment may be imposed. The National Drug Law Enforcement Agency, in 2011 commenced night patrols on major roads in Osun State to combat and intercept trucks that are usually used to traffic cannabis during the night. In an annual report of the National Drug Law Enforcement Agency in 2014, 3,271 suspected drug traffickers made up of 3,062 male and 209 female offenders were arrested with a total quantity of 205,373 kg of cannabis seized. ^ Ministerial Committee on Drug Policy. (2007). National Drug Policy 2007–2012 (PDF). Wellington: Ministry of Health. ISBN 978-0-478-30751-1. Retrieved 1 August 2015. ^ a b Seshata (23 October 2013). "Cannabis in Nigeria". Sensiseeds. Retrieved 1 August 2015. ^ "Assessing-Nigeria's-Drug-Control-Policy" (PDF). Count the Costs. Retrieved 1 August 2015. ^ Alexander, Boroffka (2006). Psychiatry in Nigeria. Brunswiker Universitätsbuchhandlung. p. 135. Retrieved 1 August 2015. ^ Nils Gilman; Jesse Goldhammer; Steven Weber (24 March 2011). Deviant Globalization: Black Market Economy in the 21st Century. A&C Black. pp. 116–. ISBN 978-1-4411-7810-7. ^ Chioma Obinna (16 July 2013). "Young adults, highest users of marijuana, others in Nigeria –POLL". Vanguard. Retrieved 1 August 2015. ^ a b c Professor Anita Kalunta-Crumpton (28 June 2015). Pan-African Issues in Drugs and Drug Control: An International Perspective. Ashgate Publishing, Ltd. ISBN 978-1-4724-2214-9. ^ 2006 World Drug Report: Analysis. United Nations Publications. 1 January 2006. pp. 2090–. ISBN 978-92-1-148214-0. ^ John David Yeadon Peel; African Studies Association of the United Kingdom (1998). Biennial conference: School of Oriental and African Studies, 14-16 September 1998 : ASAUK 1998 : comparisons and transitions : papers. African Studies Association of the UK. p. 48. ^ Etannibi E. O. Alemika (1 January 1998). Narcotic Drugs Control Policy in Nigeria. Development Policy Centre. p. 34. ISBN 978-978-34819-0-9. ^ "Drug Abuse In the Global Village Drug Abuse Among African Youth". Retrieved 1 August 2015. ^ "22 PERCENT OF NIGERIANS SMOKE MARIJUANA". The Nigerian Voice. 22 November 2010. Retrieved 1 August 2015. ^ "Nigeria's romance with MARIJUANA". The Nation. 15 December 2014. Retrieved 1 August 2015. ^ "World Drug Report 2014: Nigeria records highest cannabis seizure in Africa". National Drug Law Enforcement Agency. 8 April 2014. Retrieved 1 August 2015. Obot Silas, Isidore (1993). Epidemiology and Control of Substance Abuse in Nigeria. Centre for Research and Information on Substance Abuse (CRISA). Retrieved 1 August 2015. Etannibi E.O., Alemika (1993). Narcotic Drugs Control Policy in Nigeria. Development Policy Centre. Retrieved 1 August 2015. This page was last edited on 9 January 2019, at 18:16 (UTC).